Malavika Sarukkai is a Chennai-based Bharatanatyam dancer and choreographer. Courtesy photo. 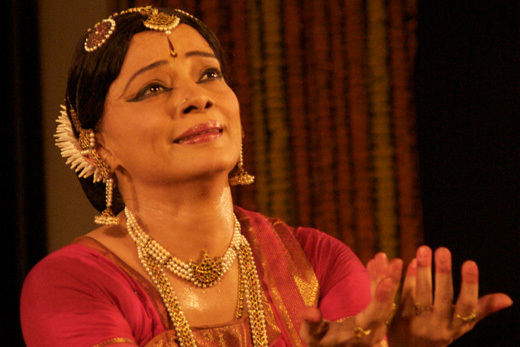 Indian classical dancer Malavika Sarukkai and film director Sumantra Ghosal will lead a conversation following a free public screening of the documentary, “The Unseen Sequence: Exploring Bharatanatyam through the Art of Malavika Sarukkai,” at Emory University on Sunday, Oct. 5. The documentary screening will begin at 3:30 p.m. in Emory Law School's Tull Auditorium. Organized by Emory’s Claus M. Halle Institute for Global Learning, the event is part of the annual Sheth Lecture in Indian Studies. "The Unseen Sequence," starring Sarukkai and directed by Ghosal, explores the history of Bharatanatyam dance and the life work of Sarukkai through exclusively filmed performances, historical re-creations and in-depth interviews. A Chennai-based dancer and choreographer, Sarukkai is widely considered the most accomplished Bharatanatyam performer of our day. Ghosal began making documentaries in the early 1990s and turned his attention to the arts in 2006, when he produced and directed a series of films for the India Foundation for the Arts. Admission to the event is free, but registration is recommended. Established in 1997 with a gift from Claus M. Halle, the Halle Institute for Global Learning (www.halleinstitute.emory.edu) is Emory’s premier venue for visits by distinguished policymakers and influential public intellectuals from around the world. The Halle Institute’s programs strengthen faculty distinction, prepare engaged scholars and foster greater involvement from local, national and international communities.